SUBMISSIONS TO THE EUROPEAN COMPETITIONS CLOSED ON JUNE 16TH 2017. THANK YOU FOR ALL YOUR PRODUCTIONS! The SEFF '17 European Competition is a competition for documentary films, whose goal is to seek out films that broaden the concept of documentary cinema and break its stereotypical image. Each year, the competition presents several dozen carefully selected titles. The chosen documentary films are a cross-section of works that stand out against the background of tired formulae and seemingly played-out topics. Creators known by few and film veterans alike will have a chance to confront their productions with the opinions of the jury and the festival audience. Thanks to the availability of technology and the ease with which people can communicate globally, we can enjoy innovative and exciting cinema that abolishes our prior perception of documentary film, and broadens our horizons. The films presented at the festival are selected by a Polish-German Program Committee. Its members search for productions that cross the formal boundaries and exhibit an unconventional approach to reality – productions that are documentary trailblazers. Premieres are considered especially significant. Awards are given by an international jury, which is assembled by the organisers. Apart from film screenings, a relevant and characteristic part of the European Competition are discussions with the presented films’ creators. The final deadline for submissions is 16.06.2017. In order to submit your film, please send us a correctly filled entry form and a preview copy. Details concerning the open call can be found in the Terms and Conditions of the European Competition for documentary films. Please fill in details. All fields with "*" are required. In accordance with the Terms and Conditions of Szczecin European Film Festival's European Competition for documentary films, the Program Committee reserves the right to also present the submitted works in the Accompanying Program. Has the film had a world premiere? If not, will the film have a world premiere before SEFF '17 (12-16.10.2017)? Check, if yes. Has the film had a Polish premiere? If not, will the film have a Polish premiere before SEFF '17 (12-16.10.2017)? Check, if yes. Has the film been presented at other festivals before SEFF '17 (12-16.10.2017)? If not, will the film be presented at other festivals before SEFF '17 (12-16.10.2017r.)? Check, if yes. The possibility to screen other formats than those listed above must be agreed upon individually with the organiser. Pay 5 euros to submit your film. 1.1. The organiser of the Szczecin European Film Festival (hereinafter referred to as the Festival) and of its competition section (the European Competition, TELEFON ART, POP SEFF, West Pomerania Shorts) is the OFFicyna Association (hereinafter referred to as the Organiser), located in Szczecin, postal code 71-445, 3–4 Lenartowicza street. 1.2 The European Competition takes place from the 19th of October until 23rd of October 2017 in Szczecin. 1.3. Detailed information on the Festival and its program can be found at www.europeanfilmfestival.szczecin.pl. 1.4. 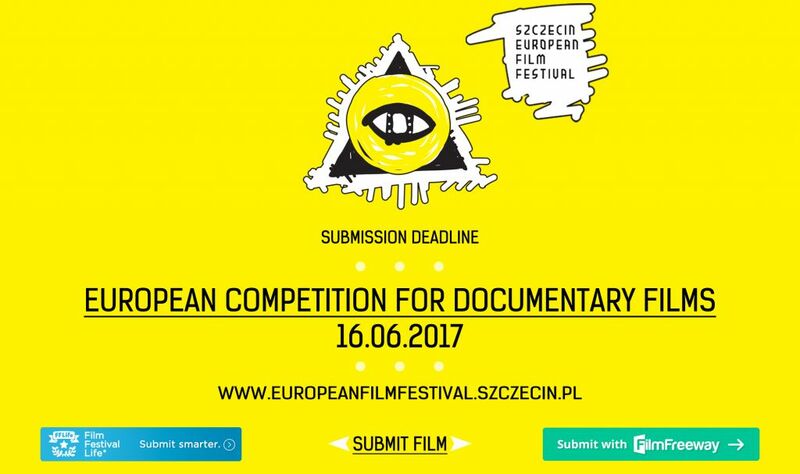 The European Competition entry form is available online at www.europeanfilmfestival.szczecin.pl. 1.5. The films can be submitted to the competition also through the online platforms FilmFreeway (https://filmfreeway.com/festival/SzczecinEuropeanFilmFestival-304326) and FilmFestivalLife (http://www.filmfestivallife.com/Szczecin-European-Film-Festival/). 1.6. Submitting the film/films though the festival website and online platforms FilmFreeway and FilmFestivalLife incurs a fee specified by those sites. 1.7. The profile of the European Competition for documentary films relates to the latest trends in the development of artistic audio-visual editing. The European Competition is concerned mainly with the formal crossing of boundaries, referring to the perception of reality – especially such crossing that enables new perspectives. 1.8. The films presented in the competition are selected by a Polish-German Program Committee. 1.9. The Program Committee reserves the right to present the film within the Accompanying Program. 1.10. The documentary films admitted to the selection process will have a running time no longer than 90 minutes, will be produced after January 1st 2016, and will be of European production/co-production. 1.11. Special attention is given to film premieres. 1.12. Copies with English subtitles are required. 1.13. The awards are given by an international jury created by the Organiser. 1.14. The qualified films may be screened using the following formats: DCP, 35 mm, BluRay, DVD, ProRes, H.264 (e.g. MKV, MP4). The possibility to use other formats must be individually agreed upon with the Organiser. 1.15. A film selected for the European Competition, whose participation has been confirmed, cannot be withdrawn from the program after August 31st 2017. 2.1. The final deadline for submissions is June 16th 2017. 2.2. In order to submit a film, a correctly filled entry form needs to be sent in, as well as a preview copy on DVD or on another medium. A link to the film (e.g. Vimeo, YouTube, etc.) is also accepted, as is uploading the film file onto a website or server. Copies with English subtitles are required. 2.3. Additional material required: a short synopsis in English (90 words max. ); dialogue lists in the original language and in English, as well as in Polish and German, if possible; a bio and filmography of the director (please give original titles); film stills (at least three); a photograph of the director. 2.4. The Organiser will only pass the information about the selection outcome to those, whose films have been qualified to the Festival program. 2.5. The Program Committee is not obliged to justify their decisions regarding film selection. 2.6. The Organiser does not return the submitted materials. 2.7. The qualified films are made available to the Organiser free of charge. 2.8. The qualified films' screening dates and locations are established by the organisational team, in consultation with the films' respective representatives. 2.9. In addition to the festival copy, the film authors are asked to include a DVD/Blu-ray-Disc with the post-festival screening version of the film (without the “preview copy” label), recorded in optimum quality. Disc shall remain in the Festival's archive. 3.1. Upon qualifying a film to the European Competition or a presentation within the Accompanying Program, the entrants will be asked to submit additional materials (e.g. posters, folders, leaflets, trailers). 3.2. The Organiser reserves the right to use selected excerpts (up to 5 minutes) from the qualified films for the Festival's promotional-informational purposes (e.g. the Festival trailer, TV broadcasts, etc.). 3.3. The Organiser reserves the right to use the submitted film and author information on the Festival website, in social media (e.g. Facebook), as well as in all promotional materials (e.g. the catalogue, the program guide, press kits, etc.). 3.4. The Organiser reserves the right to use the submitted materials for promotional activities associated with the Festival before, during, and after closing this year's edition. 4.1. The preview copy is to be submitted along with a filled entry form until June 16th 2017 to the following address: Szczecin European Film Festival '17, al. Wojska Polskiego 90, postal code 70-482 Szczecin, Poland; or to competition@seff.pl (in case of digital files). 4.2. The Festival presentation copy is to be submitted until September 13th 2017. The copy will be sent back until November 23rd 2017. The copy is to be submitted to the following address: Szczecin European Film Festival, al. Wojska Polskiego 90, postal code 70-482 Szczecin, Poland; or to competition@seff.pl (in case of digital files). 4.3. The films are sent at the expense and responsibility of the sender. Parcels sent at the expense of the recipient will not be accepted. 4.4. 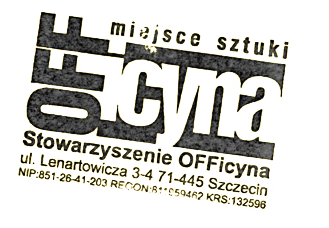 The Organiser does not take responsibility for the transport of film copies to Szczecin (Poland). 4.5. The Organiser covers the expenses associated with sending the film back after the Festival. 4.6. The film copies are insured for the duration of the Festival in Szczecin, from the moment of receiving the copy from the delivering company until the moment of handing it over to the delivering company once again. 4.7. In the case of damaging or losing the medium, the Organiser covers only the expense of the physical medium (e.g. the pendrive, DVD, hard drive). 5.1. The entrant gives the right to the Organiser, within the meaning of art. 31 of the Data Protection Act 1997 (Dz. U. from 2002, no. 101, item 926 with later changes), to process their personal data. 5.2. The transfer of the right to process refers to the personal data of the individuals listed in the entry form and the individuals listed on the payroll, especially the filmmakers. The processed data includes the following: first and last name; electronic mail address; phone number; occupation. 5.3. The Organiser is authorised to further transfer the processing of personal data to other parties, to the extent required. 5.4. The entrant agrees to provide information about the Organiser's activities via e-mail. 6.1. Entering a film to participate in the Festival is synonymous with accepting the above terms and conditions, as well as with accepting the information included in the entry form. 6.2. Entering a film to participate in a competition obliges the author, or their representative, to be present during the festival presentation as well as during the discussion with the audience in Szczecin, in the event of their film being qualified. 6.3. The Organiser reserves the right to change these terms and conditions as well as the entry form. 6.4. Issues not covered within the terms and conditions will be handled by the Festival directors. 6.5. The sums of cash prizes are pre-tax. The prizes given to the winners of the European Competition are subject to taxation in accordance with Polish law.